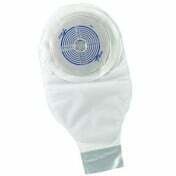 The ActiveLife Convex One-Piece Pre-Cut Drainable Pouch with Durahesive Skin Barrier is a transparent 12 inch pouch with 1-sided comfort panel and tape collar. 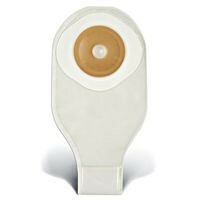 A lightweight, flexible, one piece system, the ActiveLife ostomy system combines the skin barrier and pouch in one simple, easy-to-manage system. 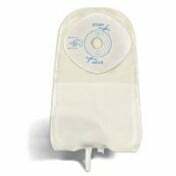 Pre-cut pouches are not as customizable as Cut-to-Fit pouches however they do save time and are often preferred by users whose stoma is fully healed or not changing sizes. 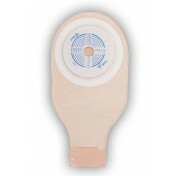 Pre-Cut skin barrier fits stoma sizes from 3/4 inch up to 2 inch. 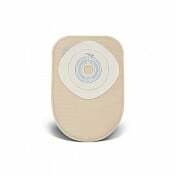 A convex skin barrier has a curved base in which the curves presses down on the skin and allows the stoma to stick out to ensure the output empties into the pouch instead of leaking underneath. This can increase wear time and reduce leakage which can in turn reduce skin irritation that can arise from frequent leakage. 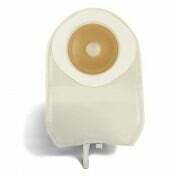 Durahesive Skin Barriers are suggested for people with a urostomy or ileostomy, whose stoma output is liquid, semi-liquid or high output. 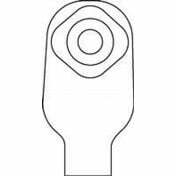 Also suggested for people with a colostomy where stoma output is more liquid. If you prefer ConvaTec's Stomahesive over the Durahesive you may want to check out the ConvaTec ActiveLife Convex One-Piece Drainable Pouch with Stomahesive Skin Barrier or if you are looking for a flat skin barrier as opposed to a convex version you may want to check out the ActiveLife One-Piece Pre-Cut Drainable Pouch with Stomahesive Skin Barrier. 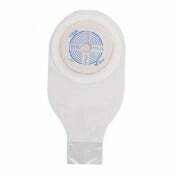 Fits stoma sizes 3/4 Inch to 2 Inch. One-sided comfort panel and tape collar. Includes 1 tail closure per box.